Jade Simo is a full-time mom of five. She has been married twenty years to her high school sweetheart and together they have moved 12 times. They have finally found home in Dallas, Texas. 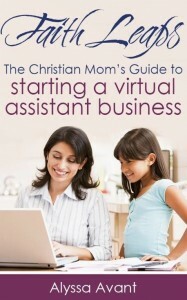 She is the Bible Journaling Virtual Assistant at The Holy Mess. 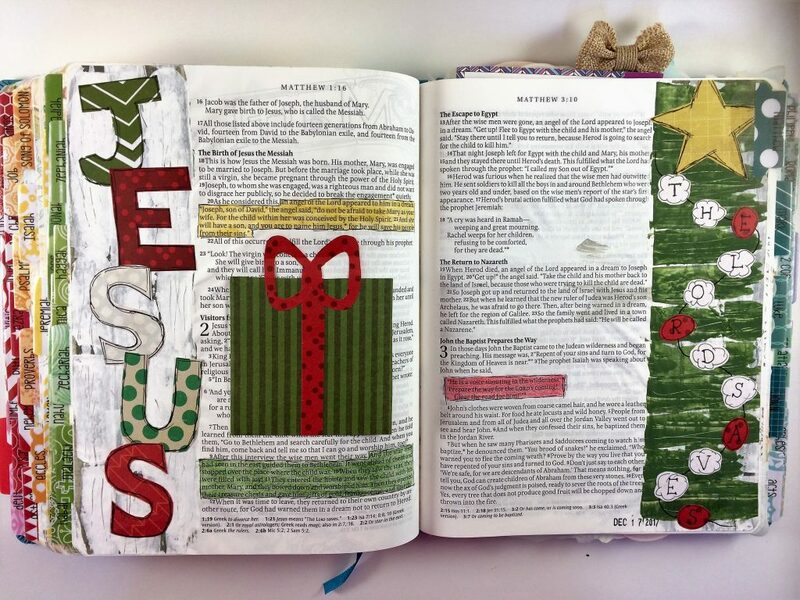 As a former middle school teacher, she has a big soft spot for those new to Bible journaling. The best part of her job is being able to motivate fellow Bible journalers to try new things and share them at The Holy Mess Bible journaling Facebook group. 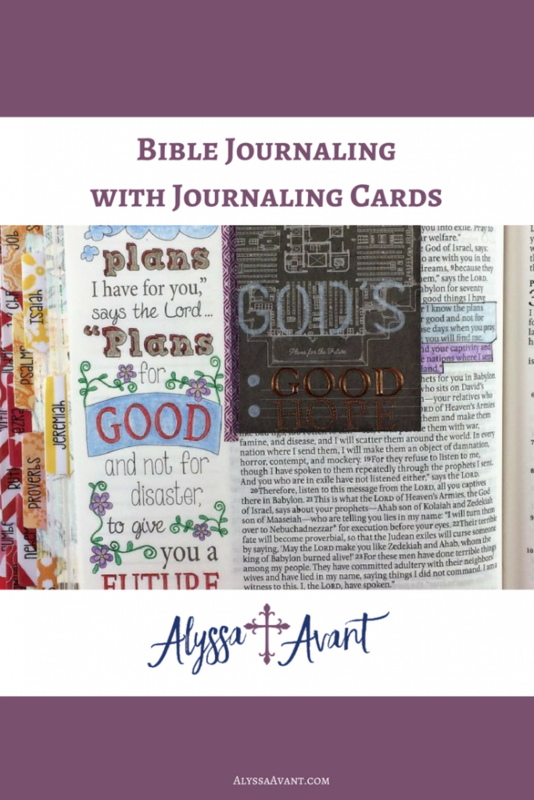 Jade is amazed at where her Bible journaling journey has taken her. She loves to see the Lord work His awesomeness in others’ journeys too. Thank you Denise. Have a blessed day. Thank you do much for you love and for sharing with us. It is my pleasure. I hope it enhancing your Bible journaling. 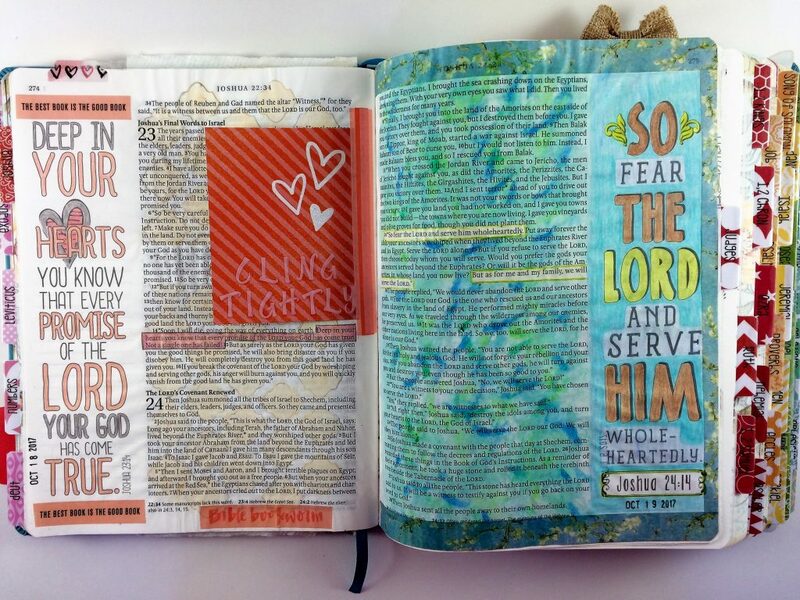 I am still very new at Bible Journaling even though I have had my Creative Bible nearly close to 2 years. 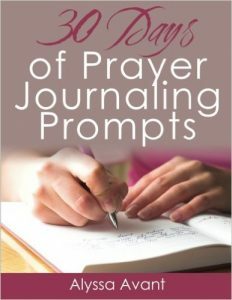 I am starting to do more and these journaling cards sound exciting to try. Gee, I hope they are just the idea you need to get going. 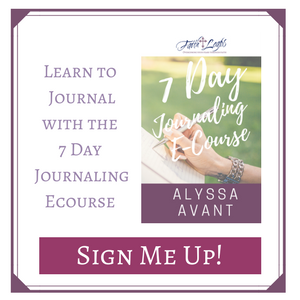 As a beginner journaling cards gave me an increased feeling of security when I was afraid to just try it. Love the cartoon clips you used. Truly inspiring your journaling. Thank you so much for sharing. Thank you Wendy for your kind words. 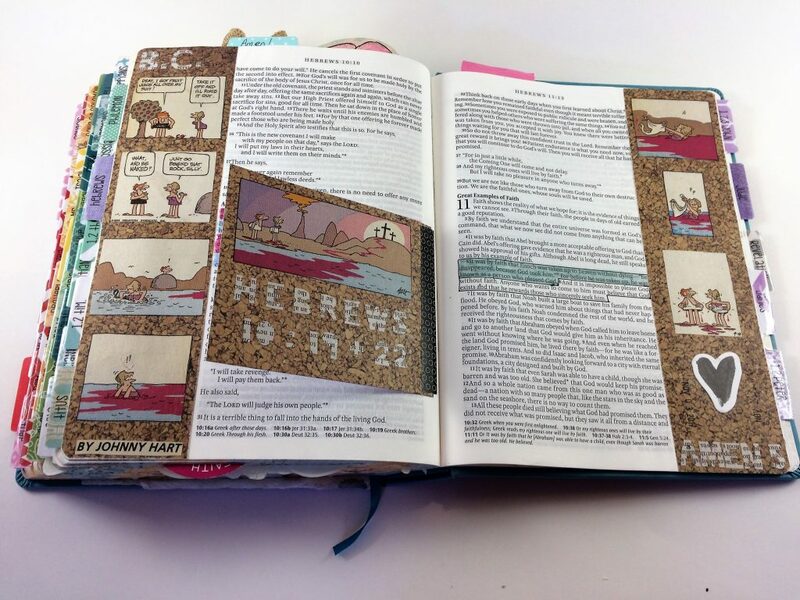 That comic strip has been tucked in my Bible for over 20 years. It feels so good for it to have a permanent home. I like the card ideas, actually i have.started to doodle on cards with a special verse, for the purpose of passing them onto people, or even leaving on park benches, or places where someone may just pick it up and read, and know God is watching them, maybe an encouraging verse for example, and pray that some discouraged soul would pick up. What an wonderful idea Caroline! Jade, I LOVE your idea for journaling cards…can I say again? LOVE IT!!!! I also noticed tabs, but couldn’t see if they were tabs for books in the Bible or life lessons that spoke meaning into your daily walk with Jesus. 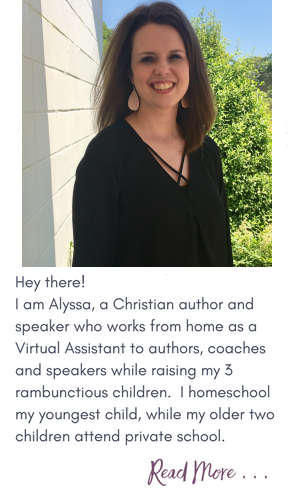 Thank you for sharing…..can’t wait to get started! Thank you Pat. Journaling cards are so fun. 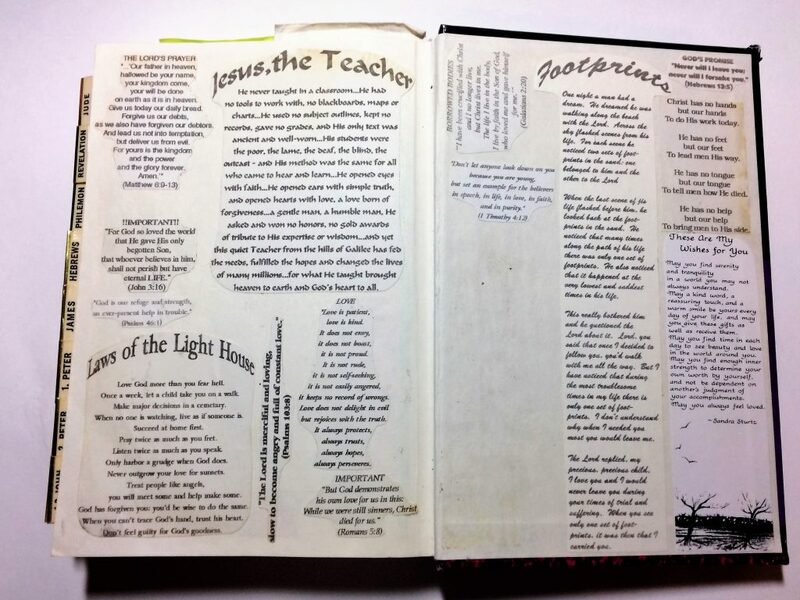 My Bible tabs are the books of the Bible and can be found on etsy at the Beauty from Ashes shop here: http://tidd.ly/3892fc99. I’ve never thought of journaling on cards. I’m really excited to try this method!! And I love Caroline’s idea of a Bible verse on one side and art on the other side. I’m excited to see what you create Denise. I actually started using journaling cards because I don’t like my handwriting very much. It created a way to journal and still have something pretty at the same time. Your work is such a blessing Jade. Thank you for sharing and giving us these great examples. 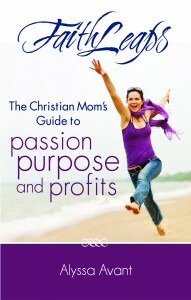 Thank you Sara and thank you for sharing theholymess.com as a creative outlet for me. Love this idea. I’m still stuck in my old-school ways and just can’t bring myself to make any of the words in my bible unreadable, so this is perfect! Thank you! You are welcome Renee. I like being able to read the words too. Have fun! My Grandson (six years old) and I made our first journaling cards yesterday. Money is tight so dollar tree and Walmart great source. Found some washi tape for 49c. Turned out better than i thought. While doing this a friend was texting me about a care package she plans on sending to a Military friend. I was prompted by the Lord to ask could in include cards. She responded by that would be great. I didn’t even know about this 4 days ago. Praise and that You, LORD. What a wonderful praise story Cynthia! Thank you for sharing with us. I come from a military family and have packed many of those boxes. I will be praying that the final destination feels as much blessing receiving them as you and your grandson felt making them.